One of the most refined and advanced lacrosse heads produced by Maverik is their outstanding Maverik Optik lacrosse head. The Maverik Optik lacrosse head is engineered for precision and accuracy, and done in a way that will not sacrifice strength or power. The Maverik Optik head includes a level 2 bottom rail. This means it has a low-mid pocket which gives offensive players a quick shot, accurate release, and increased power. A lightweight 2-strut design also helps to improve speed of the Optik head, while maintaining structure. A narrow throat on the Maverik Optik head provides maximum control for players. Additionally, the Maverik Optik was designed and crafted with multiple stringing holes for custom pocket options. Maverik’s Optik lacrosse head is made in the USA and comes in both HS and Universal spec. It’s available in available in eight different colors including white, black, orange, red, grey, yellow, lime, and carolina blue. The Optik head from Maverik Lacrosse is on sale now. You can pick one up for yourself from Amazon.com for only $89.99, and get free shipping with Prime. Check out the Maverik Optik lacrosse head below and drop us a note in the comments with your thoughts. If you want to pick one up, click here to buy now! 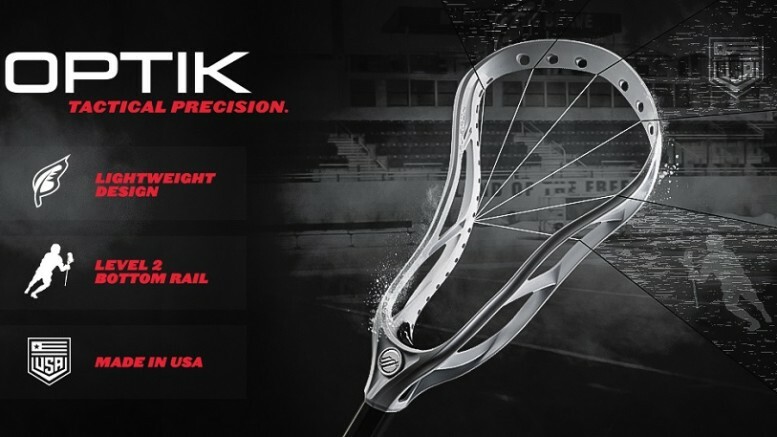 Be the first to comment on "Maverik Optik Lacrosse Head"